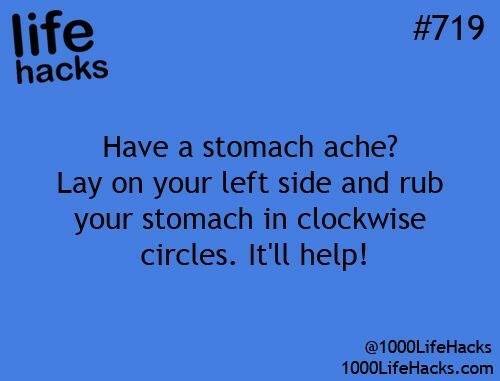 LIFE HACKS #719 HAVE A STOMACH ACHE? LAY ON YOUR LEFT SIDE - ProudMummy.com the Web's Community for Mums. LIFE HACKS #719 HAVE A STOMACH ACHE? LAY ON YOUR LEFT SIDE AND RUB YOUR STOMACH IN CLOCKWISE CIRCLES. IT'LL HELP!